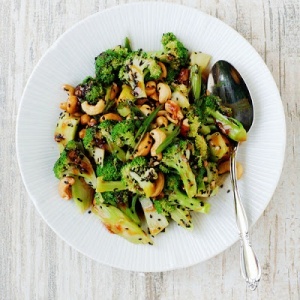 CASHEW CRUSHED BROCCOLI Broccoli is packed with all those good-for-you vitamins and minerals that the body needs. Especially rich in Iron, Vitamin B, Potassium, Magnesium and dietary fibre, broccoli is a must eat! Not the most tantalising on its own it is not always easy for us to consume sufficient amounts of this superfood. My more appetising version of broccoli adds some power packed flavour, texture and a little sweetness that should leave you wanting seconds (and maybe thirds too). Place coconut oil and crushed garlic in a large frying pan and allow to melt. raisins and sauté for 3 minutes. Add cinnamon-toasted cashews to broccoli and sauté for another minute until all ingredients are thoroughly incorporated. Serve on its own, or as a side together with grilled chicken breasts/ fish or steak.